A whole new era and X-team begins in Astonishing X-Men #13 as Alex Summer, the plasma blasting mutant known as Havok, returns to the fold. The Reavers are also back with a vengeance, and it’s up to Havok to form a new team of X-Men to stop them. However, following Alex’s recent villainous actions (because of the Red Skull’s mind-altering attack), will any of the X-Men be prepared or willing to trust Alex again? 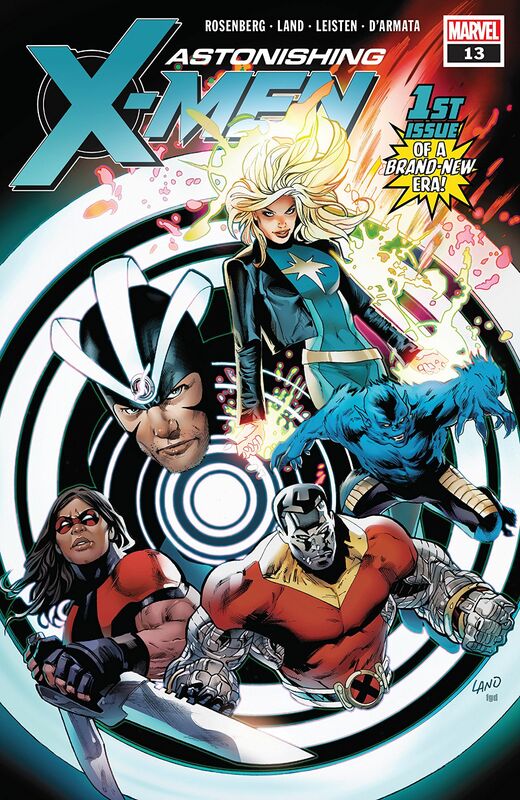 The new creative team of writer Matthew Rosenberg (Multiple Man) and artist Greg Land (The Incredible Hulk) for Astonishing X-Men usher in this next chapter in X-history featuring Havok, Beast, Dazzler, Warpath, and Colossus. Right from the outset it quickly becomes clear that Alex’s return to the X-Men isn’t going to be all plain sailing. If anything, Alex Summers finds he’s neither use nor ornament as he inadvertently treads on the Avengers toes and gets treated like a joke by students at the Xavier Institute for Mutant Education and Research in New York. Alex Summers character effectively carries the entire issue, writer Matthew Rosenberg’s witty and insightful script is packed with fast-paced action, snappy dialogue, and strong characterization throughout as we follow Alex’s attempts to get his life back on track. His viewpoint on Xavier’s dream and the X-Men’s recent interpretation of that legacy almost cause a ruckus in the classroom and inevitably leads to run in with Kitty Pryde as a result Yet, wry humour aside, Matthew Rosenberg writes Alex’s character in a way that feels far truer, flawed, and more real than ever before. There’s also the sense that Cyclops’s younger brother might finally be about to ditch that almighty chip off his shoulder and step out of his older siblings shadow at last. Astonishing X-Men #13 also boasts great artwork from Greg Land. The Reavers and Donald Pearce are the first major villains Havoc and his team mates will have to contend with. Greg Land’s pencils and Jay Leisten’s inks complement each other extremely well, dynamic page layouts energize the fast-paced action, characters expressions convey every nuance of emotion, and color artist Frank D’Aamata subtle use of color and tone – especially during Havok’s nightmare sequence – further refine this series distinctive new look and style. The reunion between Alex and Hank at Harvard which rounds off Until Our Hearts Stop Part 1 is without doubt the standout character moment of this issue. Not only does it establish the great dynamic between them, it also leads into an action-packed cliff-hanger ending, and there’s even a big surprise waiting just before the end too! While this issue doesn’t bring the new team together in its entirety just yet, it’s still great to see Alex Summers return to front an X-Team – even one that’s still very much in its formative stages. The Reavers also provide a very palpable threat; Miss Sinister is another interesting addition, and the fact a third-party is pushing everyone’s buttons also adds an equally menacing quandary into the mix. I really enjoyed Astonishing X-Men #13, there‘s lots of potential here, and this new creative team together with the entirely new direction have certainly helped to reinvigorate the title and I’m looking forward to seeing how things develop from here.